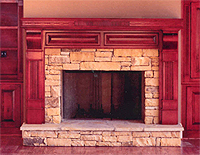 Our mantels, constructed to fit even the most unique fireplaces, will enhance the beauty of your fireplace. You select the style, type wood, length, width and color. If you do not see a style that you want, send us a picture or sketch and we will see if we can make it for you.